Enameloplasty involves removing the surface layer of enamel on the teeth to remove surface discolouration. The surface enamel can be removed and then smoothed and polished in order to retain the tooth’s natural appearance. In conjunction with whitening, an enameloplasty may be ideal and the most conservative treatment for discolourations that are very superficial in the enamel. These are used satisfactorily for mainly external discolourations and very rarely involve the second layer of the tooth. These veneers are advantageous because: not much tooth structure is removed, relatively low cost, one appointment is required. Some disadvantages are: they may stain and chip or debond over the years and need to be replaced. Even though they are easily repairable, care must be taken with everyday eating and chewing. These veneers use the same concept as direct veneers; however, the material is fabricated in the laboratory. Two appointments are required: 1) Prepare the teeth and make impressions 2) Try-in and cement the veneers. 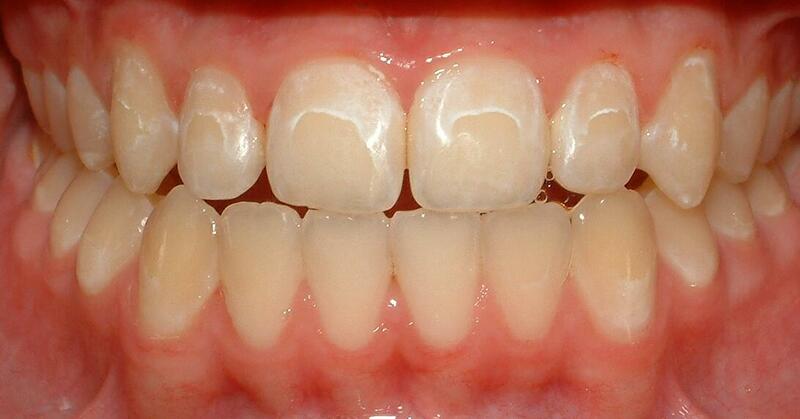 Porcelain is usually indicated for deep and dark discolourations and spaces between front teeth. They are most frequently preformed in conjunction with whitening. There are some disadvantages to this indirect method include: increased cost due to lab fees and two appointments are required. On the other hand, they do not chip or stain easily, they are made of stronger material so they last longer and look more natural. With any type of restorations, it is very important to practice good oral hygiene and obtain regular checkups and scaling to ensure the longevity of these treatment options and to prevent further progression of gum disease. Gum disease is caused by plaque and bacteria. Plaque irritates the gums, causing them to become tender and swollen and bleed easily. If not removed from the teeth, it hardens and forms tartar and calculus. Eventually the tissue that attaches the gums to the teeth is destroyed by the irritants in the plaque. Pockets are formed and eventually the jawbone supporting the teeth is destroyed, causing bone loss. Thus, it is very important to practice good oral hygiene and get regular checkups and scaling to ensure the longevity of these treatment options.